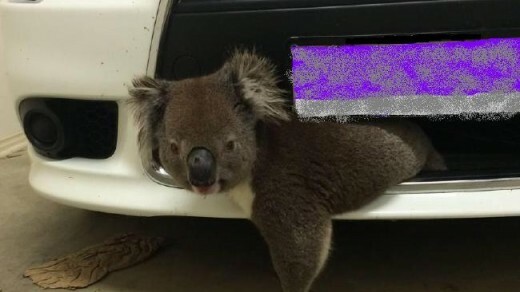 A KOALA has survived being hit at 100km/h, remained stuck in the car’s grill for 10km — and walked away with just scratches.The driver hit the marsupial on the South Eastern Freeway near Bridgewater on Tuesday (September 22) and somehow it lodged in just the right place in her bumper not to get badly injured. Fauna Rescue koala rescue co-ordinator Merridy Montarello said it was a “very, very lucky koala”. “It’s because of the particular size of it (that it survived),” Ms Montarello said. Once the driver found the koala, when her car was already in her garage, she called the Fauna Rescue koala hotline and volunteer Don Bigham arrived. ”She knew she had hit it, but I think she must have thought it was going to be dead and on the road,” Mr Bigham, 76, said. Once he managed to pull the koala from the grill, Mr Bigham brought it to the vet and X-rays revealed no fractures. The three koalas he rescued before this one had to be put down. “It’s good to get a happy story now and then,” Mr Bigham said. September is Koala Awareness Month and the busiest time for koala rescuers, with koalas moving around trying to find mates. Many koalas hit by cars are carrying joeys which can survive even if their mother does not. Fauna Rescue is calling for electronic signs on the South-Eastern Freeway to be used to display the koala hotline — 7226 0017 — and to warn drivers when a koala rescue is taking place. “If people know a rescue is happening, they can be more aware to slow down,” Ms Montarello said. She wrote to Environment Minister Ian Hunter calling for the measure last month but did not hear back.